Do you have surplus money? Are you looking for good investment ideas? 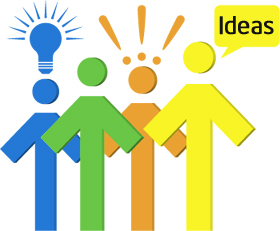 Well today we will discuss about Investment Ideas at different age. Investing your hard-earned money should be well planned and managed. That is the reason people often advice to do financial planning. Just as age impacts several aspects of your life, your investment pie should also be revised as per your age and life stage. Start early for your investments to benefit from power of compounding. Before starting investment let’s look at various asset class. Equity – Investment in stock market, which gives returns in long-term. Debt – Investment in debt instrument like bank fixed deposit, debt fund etc. This investment option is relatively safer compare to equity investment. Gold – Investment in gold can be made in physical or in demat form. Gold Investment provides opportunity to diversify across other assets. Real Estate – Investment in real estate means owning property for capital appreciation & earning rent. Investment in real estate is risky option. Cash – Keeping extra cash handy as Emergency fund. Here is quick look at how you can manage these different assets as per your age. If you are at age of 20 you are just starting your career. At this juncture you have very less responsibility and you should start investing more & more money with your first salary. Follow advice given below. Start Investing with your first salary. Invest in Tax saving Instruments. Invest in Equity Instrument more. 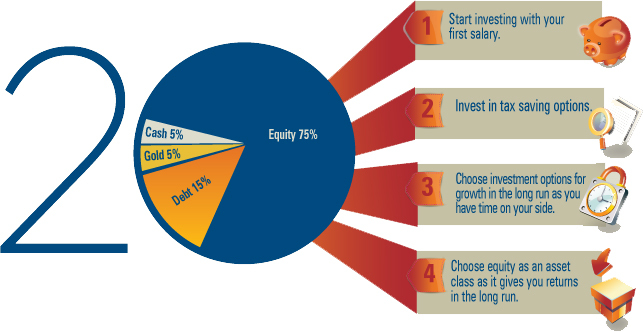 Ideally 75% of your investment should be in equity. You can invest 15% in debt, 5% in gold and 5% you can keep as emergency fund. If you are at age of 30 you have got lot of new responsibilities. With marriage and child coming in your life you have to take care of many things like car, child’s primary education etc. Take a stock of your income, expense and existing financial status. You are in the best phase of your life are your investments with you? Follow advice given below. Make SMART financial goals as per your need. Start working towards fulfilling this goal by making more and more investments. Make equity as your preferred investment choice as it enables wealth creation in long term. 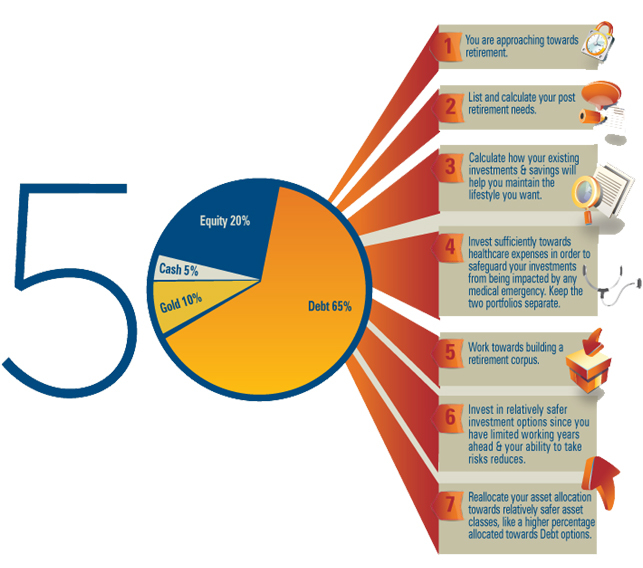 At this stage 65% of your investment should be in equity, 25% in debt, 5% in gold and 5% as cash emergency fund. If you are at age of 40 its time to review your financial goal, you must carefully look at your investments and make judgement that whether investment done by you is enough for achieving financial goal or not. It’s time to select mature investment ideas. Follow advice given below. Calculate additional amount required to achieve your financial goals. Start investing towards healthcare expense in order to safeguard your investments from being impacted by any medical emergency. Work towards building a retirement corpus. At this juncture you should gradually reduce your investment exposure to riskier investment options and move to relatively safer option. 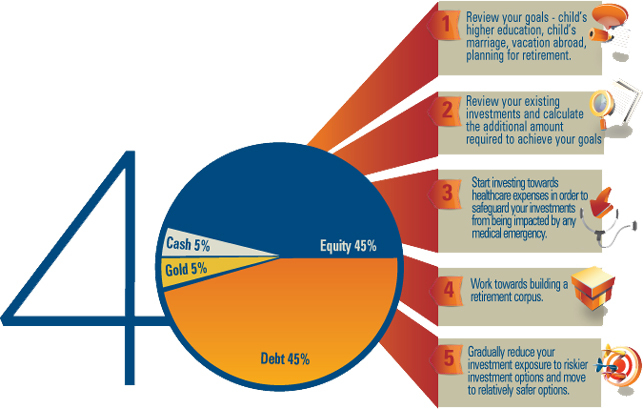 At this stage 45% of your investment should be in equity, 45% in debt, 5% in gold and 5% as cash emergency fund. If you are at age of 50 its time to work towards your retirement needs, list and calculate your retirement needs. Calculate how your existing investment and saving will help you to maintain the lifestyle you want. It’s time to relax from risky investment. Follow advice given below. Invest more towards healthcare expenses and medical emergencies. Building good retirement corpus should be at highest priority. At this age you should invest in safe investment options. At this age debt investment should be around 65%, Equity 20%, Gold 10% and cash 5%. Asset allocation advice given above is purely on the basis of your age. Check your ideal asset allocations as per your risk appetite and other factors like number of dependants, earning capacity etc. before making an investments. If you find this post helpful, feel free to share it with your friends on facebook and twitter. « How to check UAN (Universal Account Number) Online?